This week marks the seventieth anniversary of D-Day. On June 6, 1944, more than 150,000 Allied forces took part in one of the biggest invasions in history. The effort to liberate France from the Germans was the bloodiest day in American military history since the Civil War. Nearly 2,500 Americans lost their lives. World leaders, including President Obama, are in Normandy this week to commemorate the anniversary. Diane and a panel of guests about the significance of D-Day and why it still resonates today. John McManus Historian, author and professor, US military history at Missouri University of Science and Technology. He is the author of "The Dead and Those About to Die; D-Day: The Big Red One at Omaha Beach." Ronald Spector Professor of history and international affairs, The George Washington University. He formerly taught at the National War College and U.S. Army War College. Rick Atkinson Author, "The Liberation Trilogy," three volumes of history about the US military's role in the liberation of Europe in World War II. He has won Pulitzer Prizes for his reporting and for his book "An Army At Dawn." President Franklin Roosevelt addressed the nation with a prayer after the invasion of Normandy, France, on June 6, 1944. This color film, hosted on the BBC , offers a retrospective at the D-Day attack. Excerpted from “The Dead and Those About to Die: D-Day: The Big Red One at Omaha Beach” by John McManus. © 2014. NAL/Penguin Random House.All Rights Reserved. MS. DIANE REHMThanks for joining us. I'm Diane Rehm. 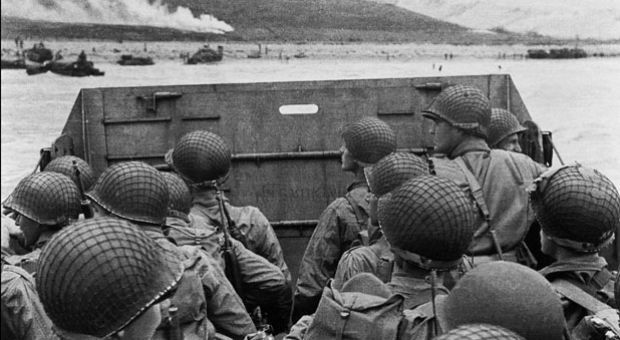 Seventy years ago this week, more than 150,000 allied soldiers stormed the beaches of Normandy. The effort to liberate France from Nazi Germany was one of the largest invasions in history. With me to talk about D-Day and why the event still resonates today: author John McManus at the Missouri University of Science and Technology, and Ronald Spector of George Washington University. Joining us by phone from Normandy, France, author Rick Atkinson. He won the Pulitzer Prize for "The Liberation Trilogy." MS. DIANE REHMAnd throughout the hour, we'll welcome your comments, your questions. Join us on 800-433-8850. Send us your email to drshow@wamu.org. Follow us on Facebook, or send us a tweet. And welcome to all of you. Thank you for joining us today. DR. JOHN MCMANUSThank you, Diane. MR. RONALD SPECTORThank you. Good to be here. MR. RICK ATKINSONThank you, Diane. REHMI'm so glad to have you all with me. John McManus, I'll start with you. As the author of "The Dead and Those About to Die; D-Day: The Big Red One at Omaha Beach," describe for us the planning that went into this really extraordinary day. MCMANUSThe planning is really extensive. It actually begins in a nascent way when the British were first kicked off the continent in 1940. They were thinking in terms of coming back to the continent and harassing Germany in some respect. As things evolve, and particularly after Russia gets in the war, there's a lot of pressure for what's called a second front, which, to the Russians, means a real full-scale invasion of France. MCMANUSTo the Americans, once they're in the war, it'll mean the same thing. So you see, as of really about 1942, planning begins under Lt. Gen. Frederick Morgan, a British general, with an American-British team. It kind of lays the blueprint out, the foundation for what Eisenhower and his team of commanders, who come along at the end in 1943, will use to expand upon and have this kind of huge multinational coalition effort to assault a hostile coast and also multi-sea, air, land forces. It is extremely elaborate by June 6, 1944. REHMAnd, Ronald Spector, as professor of history and formally a teacher at the National War College, why do you think that this particular day resonates with people, even today, even among those who were not alive? SPECTOROkay. Well, the way things are remembered and the way people want to remember and commemorate things actually evolves over time. The way that D-Day was remembered in the immediate aftermath of the wars is somewhat different from the way it is remembered now. SPECTORRight after the war, there was a great deal of pride, of course, in what had been achieved. But the overwhelming theme was sacrifice and loss. There was a great deal of grief and loss connected with D-Day. SPECTORAnd actually, for the first 10 or 20 years after D-Day, most of the visitors to the D-Day sites were not necessarily tourists. They were people who were visiting the very large cemeteries that the American Battle Monuments Commission had established in Normandy. And it's really, I think, probably with the publication of Cornelius Ryan's "The Longest Day" in 1959 where, for the first time, this is looked on kind of as a kind of adventure, you might say. REHMInteresting. And turning to you, Rick Atkinson, you are there in Normandy participating in events commemorating the anniversary. You call D-Day one of the most singular, most important days of Western civilization. Talk about why. ATKINSONOh, well, thanks, Diane. Yeah, I'm here with the National World War II Museum. We're in Caen right now which is one of the main cities in Normandy. And the gathering here of dignitaries and veterans and the children and grandchildren of veterans is really quite extraordinary now. There's a real massing around the beaches. Normandy, and particularly D-Day, represent the beginning of the final act. It's the raising of the curtain on the last act of the European War. It's an absolutely critical event in bringing that final act to a close for the allies. ATKINSONWe're quite certain by June 6, 1944 that we're going to win. We're just not sure what the cost is going to be and how long it's going to take. And the drama of D-Day, the personalities involved are beyond the ability of any novelist to invent. It is one of the great sweeping moments of drama in the history of civilization, certainly in the history of the United States. ATKINSONIf it fails, we probably don't lose the war, but we probably do lose a year. And losing a year means that many more Jews and others who are being sent to the camps go to their deaths. It means much more difficulty for the Soviets who are fighting in the Eastern front and potentially more difficulty for us if, in fact, the Soviets advance farther West than they actually do. So it's a moment of singular and profoundly high drama for all of us. REHMIt's, of course, been called the largest amphibious invasion in history. But there was the strategy to attack by sea, land, and air. Tell us about everything that happened with the parachuters, the glider landings. There was so much more than just the landing at the beach. ATKINSONWell, that's certainly true. The plan has been underway for a couple of years. As John mentioned, there had been a study group basically had been looking at this virtually from the time United States got into the war. And there's a realization that wherever you attack -- and the decision was made fairly early to attack at Normandy in the Bay of the Seine, where the River Seine empties into the Atlantic. ATKINSONAmong other reasons, it's chosen because it's not the most obvious place. The Pas-de-Calais, which is closer, is the closest part of France to England, is perhaps more obvious. And there's a recognition that there does need to be a multi-pronged attack, that most of your force is going to come over the beaches. They will come from sea from Britain, but that, at the same time, there are three airborne divisions that are going to land, bracketing either side of the five beaches. ATKINSON...on June 5 and on through the first days of the invasion. REHMAnd, of course, Ronald Spector, as has been said, it took years of planning, but it was very controversial to invade France, was it not? SPECTORYes. I think the attitude of the British and the Americans toward the idea of an invasion really had a lot to do with their previous experiences in war in Europe. Going back to World War I, the British had fought for four years in France. Of course, there had been enormous loss of life. The American memory of World War I is that we had entered the war in the spring of 1917, by the fall of 1918, was all over. SPECTORThe American expeditionary force wasn't really in the war till the very late part of 1917 so that the memories of this are quite different. The British also had the memory of being forced off the continent in 1940. They had the unhappy experience of the Dieppe amphibious raid, which was supposed to test the feasibility of a landing in France. And of course Dieppe had been a tremendous disaster, so the British were not nearly as enthusiastic as the Americans about the possibility. REHMSo you had Churchill on the one side? REHMYou had Eisenhower and George Marshall on the other. And interestingly, it was Joseph Stalin who broke that impasse. SPECTORExactly right. When the allies met with Stalin at Tehran, there -- it was still uncertain when the invasion would take place. The British were still raising difficulties. And Stalin really is the one who breaks the tie by saying he wants the invasion. He wants the name of the supreme commander, and he wants it to have a date. And so that really breaks the impasse. REHMRonald Spector, he's professor of history and international affairs at the George Washington University. He formally taught at the National War College and the U.S. Army War College. Short break here. When we come back, we'll talk more and take your calls. I look forward to hearing from you. REHMAnd if you've just joined us, this week marks the 70th anniversary of D-Day. On June 6, 1944 more than 150,000 allied forces took part in one of the biggest invasions in history. We've got three experts here with us to talk about that day and its aftermath. John McManus. He's professor of U.S. military history at Missouri University of Science and Technology. He's the author of "The Dead and Those About to Die; D-Day: The Big Red One at Omaha Beach." REHMRonald Spector is professor of history at George Washington University. And joining us by phone from Normandy, France is Rick Atkinson. He's the author of "The Liberation Trilogy," three volumes about the U.S. military's role in the liberation of Europe in World War II. He's won Pulitzer Prizes for his reporting and his book "An Army at Dawn." Let me turn to you now, John McManus. June 6, why did Dwight Eisenhower decide on June 6? MCMANUSWell, pretty much, you know, to a great extent what's dictating a lot of the decisions and the planning for this entire operation is the availability of shipping, particularly the availability of landing craft. Originally, you know, as Ron had mentioned at the Tehran conference, once the allies have kind of committed the idea of launching a second front in 1944, the target date is May, 1944. But there wasn't enough shipping, enough landing craft to really pull this off yet primarily because of the Anzio invasion in Italy in January, 1944. MCMANUSSo it had to be postponed a month. And the allies had decided that they wanted to go in at low tide on the landing beaches and that the airborne needed basically a full moon to have the proper dropping conditions. So when you factored all that in, in early June you had really three choices, June 5, 6 or 7. And June 5 becomes quickly off the table because of a terrible storm that's coming in. And it's just going to make any invasion basically impossible. MCMANUSSo Ike has to postpone it a day and then he has to just sift through dozens of weather reports to ultimately decide on June 6 as kind of an opening in the system that allows weather that's at least good enough, while nowhere near ideal. REHMAnd the night before the invasion, General Eisenhower addressed soldiers. He addressed them directly. Let's hear this radio broadcast. GENERAL DWIGHT EISENHOWERSoldiers, sailors and airmen of the Allied Expeditionary Force, you are about to embark upon the great crusade toward which we have striven these many months. The eyes of the world are upon you. The hopes and prayers of liberty-loving people everywhere march with you. In company with our brave allies and brothers in arms on other fronts, you will bring about the destruction of the German War machine, the elimination of Nazi tyranny over the oppressed peoples of Europe and security for ourselves in a free world. GENERAL DWIGHT EISENHOWERYour task will not be an easy one. Your enemy is well-trained, well-equipped and battle-hardened. He will fight savagely. But this is the year 1944. Much has happened since the Nazi triumphs of 1940, '41. The United Nations have inflicted upon the Germans great defeats in open battle, man to man. REHMWhat a powerful statement, John. Why did they decide to invade the beaches of Normandy and not elsewhere in France? MCMANUSWell, Calais originally was the first choice simply because it was so close to England. You could have quick turnaround and resupply. You could have air cover very easily. You had good ideal flat-landing beaches that would be suitable for vehicles for tanks and the like. You had port cities that could sustain the armies once they were ashore, and that was, of course, a major problem that the logisticians would have to work out. MCMANUSYou had a good road net that led directly to the industrial (word?) in Germany and to Berlin. But of course the Germans knew this too, so Calais is just too heavily defended to be assaulted. So Normandy is a second choice that is thought of as suitable and has good enough beaches, particularly on the Calvados coast. It's got a port city at Caen and at Cherbourg. And, you know, actually it's only about two plus hours driving-wise to Paris. So there is that political objective insight as well. REHMAnd to you, Rick Atkinson, here's a question posted on our website by Steven. He says, "The HBO series Band of Brothers showed American troops parachuting into Normandy and knocking out a machine gun nest ahead of landing on the beaches. Was this or something like this the reason that Utah Beach was so much less bloody than Omaha Beach? ATKINSONNo, that's not the reason why. Utah Beach proved to be relatively benign compared to Omaha. The landings on Utah Beach, which is at the far west end of the five beaches, were supposed to land about a mile away from where they actually did land through navigation errors and currents. There had been a bad storm. The sea was still quite rough. And the forces were pushed away unwittingly from the actual spot on the beaches where they'd intended to land. This proved to be sort of a happy accident. ATKINSONThe forces came ashore. The terrain there, unlike Omaha, is relatively flat. You don't have the plunging fire from German emplacements up on the cliffs that you do at Omaha Beach. And the 101st and 82nd Airborne Divisions had been dropped onto the Cotentin Peninsula behind the Utah Beach landing sites. And they were supposed to help to prevent any counter attack by the Germans on that beach and the other beaches. ATKINSONNow the landings -- there were six regiments, about 13,000 paratroopers altogether in those two divisions -- the landings were completely confused. Only one of the six regiments landed anywhere close to where it was supposed to. You had paratroopers scattered from Cherbourg in the far north to up to 25 miles south of their intended drop zones. ATKINSONWhat happened as that the Germans were also confused by this. The 101st Airborne Division, in particular, helped open up the causeways off of the beaches. And in general the Utah Beaches -- the Utah landings proved to be successful and quick. REHMAnd, Rick, another question for you from Patricia in Gaithersburg, she says, "With all the D-Day planning done in secret, I'd like to know when the American public finally learned about this invasion. How was the news received at the time?" ATKINSONWell, the American public learned about it when the Germans learned about it. The landings were postponed for a day because of a pretty nasty storm that had churned through Britain and across the English Channel. There was great anxiety, of course, that the Germans not get even an hour or two hours advance warning. There was concern that if they got 24 to 48 hours they would be able to mass enough reinforcements, armored forces in particular, to defeat the landings on the beaches. ATKINSONSo the announcement was made to the world, the American public included, as the landings were beginning to take place. The first landings were about 6:30 in the morning on June 6, which was a Tuesday. The German's were caught quite surprised. They were expecting an invasion at some point. They didn't know where. They didn't know when. The senior commander in this sector of Normandy, Erwin Rommel, was away. He had gone home to see his wife in Harlingen, Germany. And then he was going to go see Hitler in Bavaria. He was not here when the landings occurred. So there was a great deal of confusion by -- on the part of the Germans but they were not informed in advance and neither was the American public. REHMAnd for many people during World War II, Edward R. Murrow was the voice of the war. And let's hear one of his broadcasts from London on D-Day. EDWARD R. MURROWThere is no indication that the Germans have put in a counterattack. Tonight we were told the names of some of the American ships participating in the bombardment. The Augusta is there, so is the Tuscaloosa, likewise the Nevada. The Japanese tried to sink it at Pearl Harbor. All day allied heavy bombers have been operating in support of the ground troops. they've encountered no fighter opposition. EDWARD R. MURROWAs a matter of fact, the refusal of Germans to commit their force is one of the principle subjects of conversation here tonight. And the reputation of the German armies is still considerable and there is no disposition to discount their power to hit back. But the general impression is that we are now in a position to start pouring the material ashore. REHMAnd to you, Ronald Spector, hearing about this invasion, we cannot imagine the extent of the casualties that took place. SPECTORWell, the casualties on Omaha Beach of course were very, very heavy. The casualties on the other beaches were actually somewhat less than the planners had feared. So that the invasion -- as one general put it before D-Day, the invasion seemed much harder than it was going to be. After D-Day it seemed much easier than it actually was. REHMAnd John McManus, General Eisenhower said that the allied victory really had a great deal to owe to the Higgins boat. Explain that to us. MCMANUSYeah, no question. I mean, a few moments ago I mentioned how shipping dictates a lot of the conversations and the planning. Well, the reasoning for that is because you needed so many transition craft to get troops and vehicles and stuff to the beaches. And at the outset of the war, the allies were not prepared for that. They had to gear up their ship-building capacity and make so many of these landing crafts, the most famous of which are of course the Higgins boats. MCMANUSIt's basically 32 to 36 soldiers packed aboard this landing craft, a shallow draft boat with a ramp at the front. And it's crewed usually by two to three naval or coast guard personnel. They bring it into the beach, slant the ramp down and the soldiers go off, and not randomly. They go off in a kind of choreography of what your job happened to be, machine gunners, mortar men, riflemen, whatever you happened to do. REHM...because they're targets right there. MCMANUSThey're open targets and many of the -- you know, you mentioned Erwin Rommel earlier. His concept was to stop the allies at the waterline. And so he has coated these beaches with obstacles, mines and the like that are to some extent designed to destroy the landing craft like the Higgins boats. So that's really the first thing you're going to have to encounter when you hit the beach, certainly at Omaha Beach, which is among the most heavily fortified. REHMAnd you're listening to "The Diane Rehm Show." Rick Atkinson, talk about how the Germans had been stationed, where they were and how they were able to create so many casualties on that beach. ATKINSONWell, the Germans have a big problem because they've got 3,000 miles of coastline from Norway to the French Spanish border to worry about. They know the odds are higher of an invasion coming in certain areas rather than others. They know that somewhere along the French coastline it's more likely than the allies landing, for example, in Norway. Particularly after Rommel was given the responsibility of trying to shore up the so-called Atlantic wall, the defenses along this long perimeter, the intensification of German fortifications, the laying of millions of mines, all of this picked up substantially at the beginning of 1944. ATKINSONWhere the landings actually took place, particularly along Omaha, Juno, Sword and Gold Beaches, the Germans have everything from machine guns known as murder holes to very heavy artillery capable of ranging the ships that are 12 to 15 miles off the coast. And what we find as we approach say Omaha Beach, which was indeed the most difficult of the five beaches, is that the Germans have smartly emplaced their weapons so if there's a crossfire it's difficult to see where they're shooting. ATKINSONThey have smokeless powder. The gun pits are built in such a way that you can't see muzzle flashes easily. It's very murky. It's early in the day. And so what you're finding on Omaha Beach, and particularly certain sectors of it, is as men are coming off of those landing crafts that John described, they're being mowed down. And they're trying to get across a wide beach. The tides in Normandy are profound. It's about a 23, 25' swing from low tide to high tide. So if you're trapped on the beach and the tide's coming in, you've got the danger of drowning. And a number of men did drown, particularly those who were wounded who couldn't crawl across. ATKINSONSo if you've seen the first 22 minutes of "Saving Private Ryan," that's about as good a depiction of what happened on Omaha Beach as we're likely to see without being there. REHMHow in the world, considering what you've just described, Rick, did the Americans manage to defeat the Germans at Omaha Beach? ATKINSON... and the British are at the other three beaches. ATKINSONAnd they're finding all they can handle also. At Omaha Beach -- now the Germans have had four years to basically shore up this Atlantic wall. And despite the carnage that's going on on Omaha Beach, some gutful men -- I think that's really how you have to look at it -- some gutful men managed to pull themselves off of the sand, get to the base of the cliffs that are behind the beaches there with some good leaders. There's one in particular named Norm Cota who's the senior officer on the beach at the time. He will later command the 28th Infantry Division. And he helps get them up these cliffs. They're mined -- the trails going up the cliffs are mined so you're finding men stepping on mines and having their foot or leg blown off. ATKINSONAnd yet by noon, despite all of the anxiety, anxiety so deep that Omar Bradley who's the senior American commander still on ship at this point is thinking about stopping the landings on Omaha. But by noon they had managed to get to the top of the cliffs. REHMRick Atkinson and after a short break, we'll be back to open the phones and hear what President Franklin Roosevelt had to say. REHMAnd welcome back as we continue our discussion of the events on D-Day, June 6, 1944. I'm going to open the phones now and take a question from Larry in Germantown, Md. Hi there. You're on the air. LARRYYeah, this is Larry. It's more of a statement. My uncle was trapping along Omaha Beach that morning. And he says, unlike, you know, the movie and everything, he says, you know, they were sitting there getting all shot up. And one guy just said, if I'm going to die, it ain't going to be on this beach, got up, started moving inland. Next thing they know is was we were in Paris liberating it. I'd also like to pass on to Mr. Atkinson that I just finished the third book -- an excellent series. Thank you, sir. LARRYI just finished Ike's memoirs and Butcher's memoirs and Gavin's memoirs. I'm going through all my library before I give it all to my nephew who's going to be at Normandy tomorrow, by the way. REHMI think that's terrific. There are so many people there. Rick Atkinson, describe the scene there today for us. ATKINSONWell, happily, the weather has given us a break. It was pretty nasty the fifth and sixth of June 1944. Right now, the sun is out. The temperatures are warming. It's supposed to be in the 70s tomorrow. The dignitaries are arriving. I know Secretary Kerry got here this morning. The president, of course, is already in Europe. The Queen will be here. Putin is around here somewhere. ATKINSONThe thing that's most striking in looking at the scene -- I was down on Gold Beach today. I was at Utah yesterday. The number of re-enactors is really extraordinary. There are thousands of them here. ATKINSON...either dressed as paratroopers or dressed -- sometimes they're wearing civilian clothes from the 1940s. ATKINSONIt's quite a scene. There's a bit of a Mardi Gras feel to the whole festival here. REHMInteresting. All right. Let's go back to the phones to Val in Charlottesville, Va. Hi. You're on the air. VALHi, Diane. I was just remembering, as I was listening to your conversation, a talk that I had with my dad years ago. He was in the Army Air Corps during the Second World War. And we were talking about the casualties on D-Day. And he said that he thought that some of those casualties could have been avoided if they had softened the beaches up ahead of time, by which I took him to mean that if they had sent in air support ahead of time. And we wondered why that hadn't been done. Thank you. REHMRonald Spector, what happened there? SPECTORWell, I think he was 100 percent right. The Americans had had extensive experience in the Pacific in assaults from the sea and amphibious operations. Gen. Marshall had deliberately an Army general, Gen. Corlett, from the Pacific to Eisenhower's headquarters to advise Gen. Bradley on what was required. Gen. Bradley's staff basically ignored him. Their feeling was that there was going to be so much air power at Normandy in the form of these heavy and medium bombers that the experience of the Pacific was irrelevant. Well, what happened was that there was formidable air power, but the heavy bombers didn't hit anything. They were very poor at hitting the target. SPECTORNaval gunfire, which was the most effective weapon in the Pacific in the amphibious operations, was way too brief. They didn't knock -- they weren't -- didn't have the time and were not able to knock out these big German bunkers which required extensive gunfire. If they had had the time, I think they would have been able to solve a lot of these problems. They had lots of firepower. They just weren't using it effectively. REHMAnd I can only imagine -- I was just a little girl at the time -- but worried Americans were listening to President Roosevelt asking the nation to join him in prayer. Let's listen. PRESIDENT ROOSEVELTAlmighty God, our sons, pride of our nation, this day have set upon a mighty endeavor, a struggle to preserve our republic, our religion, and our civilization, and to set free a suffering humanity. Lead them straight and true. Give strength to their arms, stoutness to their hearts, steadfastness in their faith. They will need thy blessings. Their road will be long and hard. For the enemy is strong. He may hurl back our forces. Success may not come with rushing speed. But we shall return again and again, and we know that, by thy grace, and by the righteousness of our cause, our sons will triumph. REHMAnd that was, of course, the voice of President Franklin Delano Roosevelt on June 6, 1944, D-Day. John McManus, by the day's end, the allies tore a gap in Hitler's Atlantic front. But then the U.S. and Canadian and British troops got bogged down in Norman hedges. Tell us about that. MCMANUSRight. I mean, D-Day is really just the beginning. You're getting a foothold in the continent of Europe. But the heaviest fighting remains to be done. And Normandy, particularly in the American sector in Normandy, what characterized it was called the Bocage country. Hedgerows, big oversize earthen berms that had generally been used to delineate whose property was whose and was ideal for defenders. It limited visibility. It allowed them to fortify the hedgerow lines and just bleed the allied forces. MCMANUS...find ways to kind of blow holes through the hedgerows to outflank the Germans, to fight in this grim, grim, bloody struggle, hedgerow to hedgerow, throughout the very soggy and warm months of June and July in Normandy. So it goes on. It's casualty intensive. REHMBut despite all those casualties and the poor planning, Rick Atkinson, D-Day is still considered the turning point of the war. Tell me why. ATKINSONWell, I think one of the reasons that we commemorate it as intensely as we do now is there were 16.1 million Americans who were in uniform during World War II. Just about 1 million of them are still alive. They're leaving us at a rate of 600 a day. This really is a kind of last hurrah where there will be quite a number of veterans here in Normandy and here on the international stage. And there are quite a few veterans. I think it's also recognized that D-Day, while, again, we know that the war is going to end in our favor, we're not sure on what terms. ATKINSON...milepost on that extraordinary journey to VE Day, May 8, 1945, the end of the war in Europe. REHMAll right. To Boston, Mass. Norman, you're on the air. NORMANThanks for another exciting show. REHMIs that how you see it, John McManus? MCMANUSWell, no. The Soviets weren't going to just win it all on their own. But they had, for this -- particularly the previous two years, contributed most to the allied war effort in grinding down the German army, and they had suffered most of the casualties. And they're also going to -- this is one thing that we tend to forget in the West. MCMANUSThey will launch a complimentary offensive 16 days after D-Day on June 22, which really inflicts massive damage upon the German army and certainly helps the allies in the West. So they're both contributing in a major way by June 1944. But I would never say that, you know, the Soviets were going to win this on their own, and they didn't need an invasion. REHMRonald, I want to ask you about something else that happened in the same week as D-Day. Americans captured the island of Saipan. Tell us what was going on in Asia. SPECTORWell, when the British and American staffs first met before Pearl Harbor at the Argentina Conference, the secret conference between Roosevelt and Churchill, it was decided that if the U.S. entered the war that the allies would concentrate on Germany first. And there'd be just a kind of holding action against Japan. But the way the war actually developed, the U.S. ends up fighting kind of simultaneous wars, both in Europe and against Japan. SPECTORAnd you can see this very dramatically in June where you have a massive invasion of Normandy but at the same time one of the biggest invasions of the Pacific War directed against the Mariana Islands and the island of Saipan and Tinian in the Marianas. And this is a very important point because from the Marianas, the new American super bomber, the B-29, can actually reach Japan. So the Japanese are going to fight very stubbornly for the Marianas. It brings on one of the largest naval battles of the war, the Battle of the Philippine Sea. And it is -- the interesting thing is it's taking place almost simultaneously with this D-Day operation. REHMAnd you're listening to "The Diane Rehm Show." Rick Atkinson, this is a very special event you are attending because the last of the World War II veterans are there. It really is kind of a last hurrah, isn't it? ATKINSONWell, and you can see that they're very feeble now for the most part and strong of heart and strong of voice, in many cases. But you don't find many veterans of either the Normandy campaign or World War II in general who aren't pushing 90. And, you know, we know that 10 years from now -- the Veterans Administration has done projections -- the number of surviving veterans out of that 16.1 million in America will drop below 100,000. So the cohort is diminishing very quickly. ATKINSONI must say that it's profoundly moving to see guys who were at Omaha Beach or at the other beaches here telling their stories again. They tend to be rather self-effacing. There's very little bravado or braggadocio about them. And the thing that's most striking to me is seeing kids, French kids particularly, coming up and thanking them -- the French, particularly in Normandy, remain grateful for what we did for them -- and asking them about their experiences. ATKINSONSo I think that you find that World War II, like all of the greatest evens in human history, is bottomless. People will be interested in it 500 years from now. But this really is the last opportunity for the veterans, those who witnessed it personally, to bear witness. And that's one of the things that I think makes this an especially poignant commemoration. REHMYou mentioned that Vladimir Putin and President Obama are there. I wonder if they are likely to come face to face. Rick. ATKINSONI'm not sure what the plan is. The White House and the Kremlin haven't consulted me on it. But I suspect that, given the difficulties in the Crimean Ukraine that, you know, the White House is not particularly keen to have any kind of a substantial interaction with Putin. And after all, I think it's actually appropriate that Putin was invited. ATKINSONThe Russians certainly played a large role, 26 million dead. And we ought not forget that. But I think that there are larger issues for this particular week to be remembered, rather than a current political topic. REHMIndeed. I want to thank you all so much for this very special program commemorating what happened on D-Day, June 6, 1944. Rick Atkinson is in Normandy. He's the author of "The Liberation Trilogy," three volumes about the U.S. military's role in the liberation of Europe in World War II. Ronald Spector, professor of history at GW. John McManus, he is professor of U.S. military history at Missouri University. Thank you all so much. SPECTORThank you, Diane. It was a real pleasure.